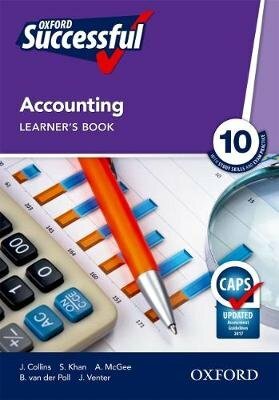 Oxford successful accounting is a trusted accounting course that is used by teachers all over South Africa. The rich content fully covers the National Curriculum and Assessment Policy Statement (CAPS). Features: the content is rich, relevant and age appropriate to ensure that learners stay interested throughout the year; topics are structured according to CAPS which makes the course easy to use in the classroom; scaffolded content and concepts provide learners with a solid foundation for exam success; a wealth and variety of activities, with thorough and detailed worked examples, consolidate knowledge and skills, and provide ample practice to ensure success in exams; appropriate language levels make content accessible, build learner confidence and support independent learning and revision; an exam section with exam tips and practice papers helps learners prepare for formal assessment and exams.